A copyright wrangle that had prevented a BBC Four adaptation of Room At The Top starring Jenna-Louise Coleman from being shown has been resolved. 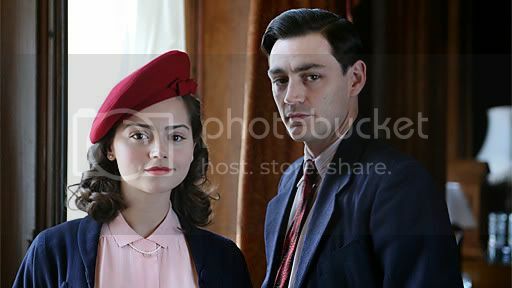 The drama, based on the classic novel by John Braine that was first published in 1957, should have been shown in April 2011 but it had to be shelved following a dispute between the late Braine's estate, represented by literary agency David Higham Associates, and Remus Films. The TV rights had been sold by David Higham Associates to Great Meadow Productions but that was challenged by Remus Films. It is now hoped that the two-parter will be shown "in the near future". In it, Coleman plays the character of Susan Brown opposite Matthew McNulty as protagonist Joe Lampton, as pictured above. The adaptation by Amanda Coe also stars Kevin McNally. It was shot at a variety of locations around Yorkshire and the north-east coast in November and December 2010.
Who Needs The Doctor's Help?